Buddies felt like having pasta for lunch last Sunday. 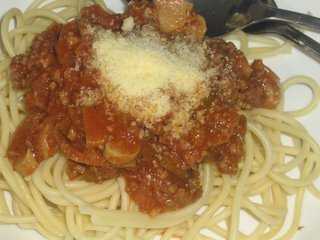 I made them Spaghetti Bolognaise, something rather simple for me to prepare since there were other things that I need to prepare as well. Heal oil in a pan. Fry the ground chilli, onions and garlic until they are softened. Put in the celery, mushroom and then ground beef. Pour in the spaghetti sauce followed by 1/2 jar of water. Season with salt n a lil sugar. Lower the heat and simmer for abt 20 mins. Meanwhile, boil a pot of water and put in abt 2 tsp of salt and a few drops of oil. When water reaches boiling point, put in the spaghetti and cook till al dente and drain. To serve, place some spaghetti on a plate topped with the spaghetti mixture and sprinkle with some parmesan cheese.